RokStories is a great widget to display your posts/pages and accompanying images as a featured item. The widget itself is facilitated by Mootools to transition between images and articles seamlessly. Perfect for showcasing featured posts/pages or image on your site. 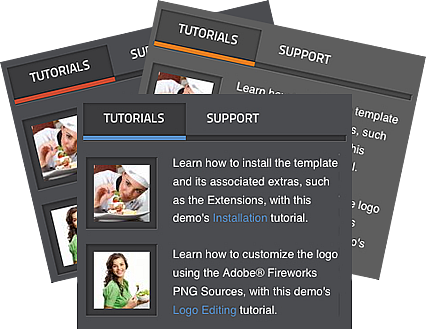 RokTabs is a tabbed content widget, standalone and themed. Content is transitioned, either by fade or scroll, powered by Mootools, which can be automatic or manual. The widget has the ability to be fully automated, switching based on time or manually by user interaction. 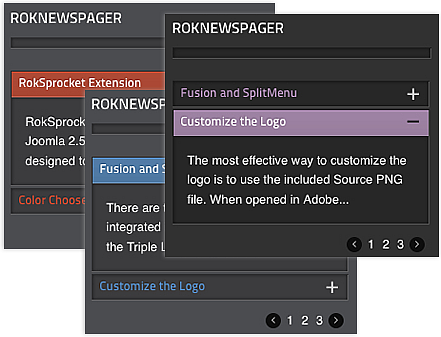 RokNewsFlash is widget to display brief snippets of an post. The plugin is perfect for Headlines as it can cycle through your chosen posts, displaying the content item title or a preview of the content itself. RokAjaxSearch offers AJAX powered real time search results for both your WordPress site content as well Google Search. There are various configuration options and parameters allowing you to enable not only Google web search, but also Google Blog search, Google Image search, and Google Video search. 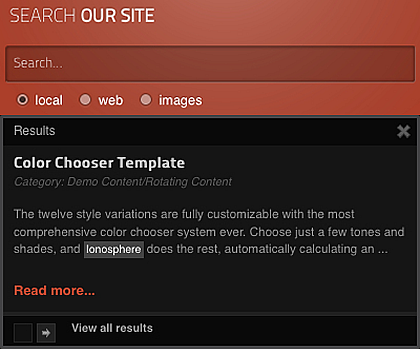 Search Options: Even more search options with Video and Images.